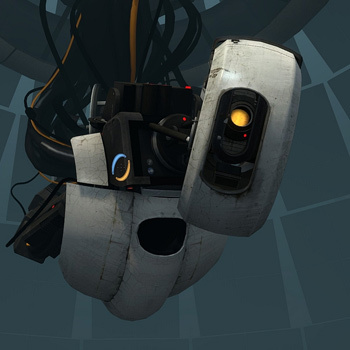 Portal is a 3D puzzle game played from a first-person perspective. The object is to advance through a series of rooms by using a gun to create a means of escape. Instead of lasers or bullets, the gun fires one of two opposing portal types: orange and red. One could be used as an entrance, while the other used as an exit. Portals can be fired on most surfaces, and the gun can also be used to pick up and toss objects. Storage and weighted "companion" cubes found within rooms are creatively used to activate switches, knock out security droids, and more. Turret guns, toxic liquid, crushing walls, and other hazards must also be avoided throughout play. A sarcastic, female-voiced computer will monitor your performance and serves as a droll guide for each area. In addition to the main game, players can unlock both a challenge and an advanced mode for more deviously designed puzzles and goals.